A marriage in bliss, or is this a last ditch attempt at keeping BlackBerry relevant? 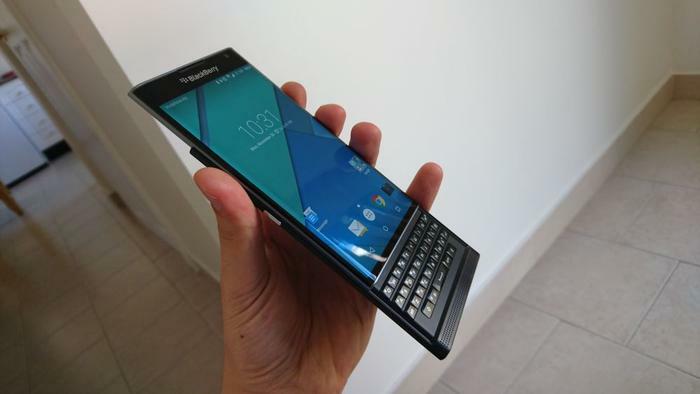 The BlackBerry Priv has a curved display, much like that featured on Samsung's Galaxy S6 Edge. A BlackBerry running on Android was an eventuality. BlackBerry 10, the company’s home baked operating system, is comprehensive, but a lack of application support meant BlackBerry’s smartphones could be used for a lot less. When BlackBerry announced Android applications would run on its phones, it was akin to raising a white flag. Routing application support from BB10 to Android was a good move. The company’s latest smartphone, the Priv, melds the Android operating system with BlackBerry’s iconic messaging and security. The two come together well with most of the operating system remaining stock. The homescreen, notification blind and settings menu remain unchanged — for the better. Parts are heavily laden with BlackBerry’s brush. The application tray, for instance, combines apps with widgets, shortcuts and a search function. Another change has to do with the task manager. Orthogonal tiles of varying sizes cascade down the page in an attractive and easy-to-use display of apps running in the background. Then there’s the introduction of more shortcuts. Pressing down the home button to launch Google Now populates two additional shortcuts that can be handpicked. Some custom apps have been shunned altogether. Media junkies will have to rely on Google’s multimedia apps, such as Photos and Play Music, to manage anything shot with the camera or to listen to their favourite songs. Both applications are mature, but doesn’t the lack of a custom media suite say something, to the tune of “we care more about security and communications than music and fun”? 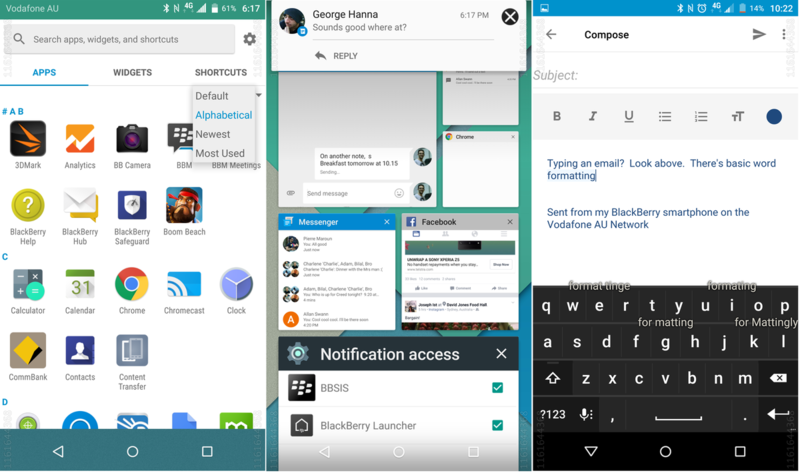 A number of core BlackBerry apps have been ported across to the Android operating system. Phone calls, text messages. 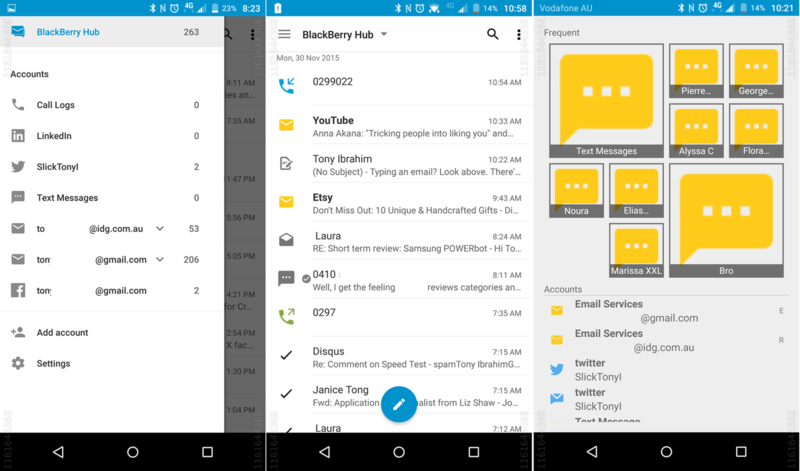 email accounts and social networking accounts are all aggregated in BlackBerry’s Hub. All communications can be overseen from this vantage point. 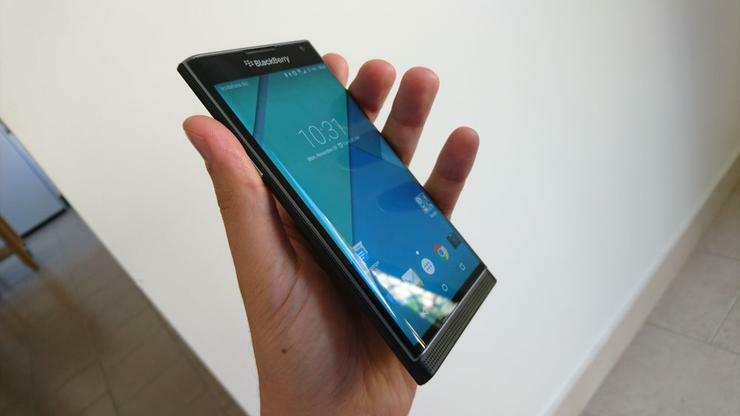 The Hub helps make sense of an interesting design feature characterising the BlackBerry Priv. Curved screens were pioneered by Samsung first and a number of rivals — LG, Apple, Sony — were expected to adopt the innovative technology. BlackBerry has beat them to it as the Priv’s screen has glass that tapers over its edges, like water washing down a waterfall. Curving the display makes it easier to gesture a swipe. Apple’s iPhone 6s was styled to promote swipes, but the flat display isn’t as effective as BlackBerry’s rendition. The hardware and the software here work closer together. BlackBerry’s Hub summarised our 312 pending notifications, 98 of which were from Twitter, one from our work email, another 211 from our personal account and two of which belonged to Facebook. We could access any one of these accounts with a simple tap, sans for the Facebook account, as it continued to crash. Older gestures are missing from the Hub. An inwards pinch in a BB10 phone would hide all of the read communications for an overview of everything that needing tending. Joining BlackBerry Hub is BlackBerry Messenger, the company’s messaging client. BlackBerry Messenger (BBM) is known for its security and it supports multiple platforms. How valuable BBM is depends on the number of contacts using it. We had two people and that’s not enough to earn the storage space it consumes on our smartphone. Workplaces relying on BBM will see the value in its secure messaging. A noteworthy addition is BlackBerry’s keyboard. Not the company’s physical keyboard, but its virtual counterpart. It is simplistic and clever. Type a message and it’ll anticipate upcoming words. Two letters and an upwards swipe can complete a much longer word. It is easy, time saving and even fun. 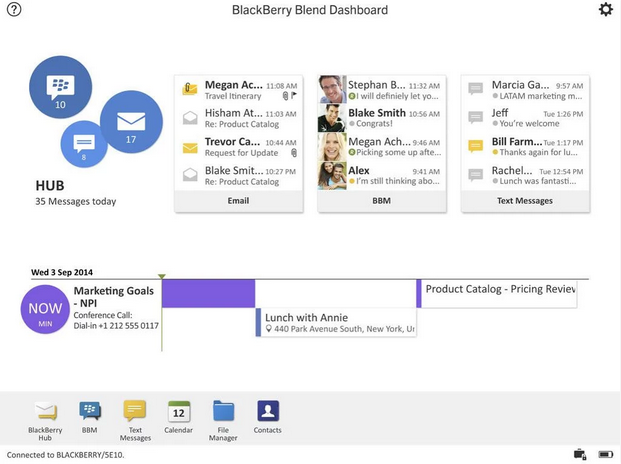 One of BlackBerry’s most coveted features is BlackBerry Blend. This virtualisation software made it possible to use BlackBerry’s Hub on your work computer. Time would be saved by not having to switch between a notebook and a smartphone. Then there's the speed afforded by a full-sized keyboard found on a notebook. The BlackBerry Priv does not support Blend. It’s the one feature missing and it’s timing is perilous; Microsoft is investing heavily in Windows 10 and its virtualisation software, Continuum.